The inquest is looking into the shooting dead of 10 people in the Ballymurphy area in August 1971. They died during the first few days after the introduction of internment. Four people died and several others were injured after what the inquest describes as “Incident 2”. 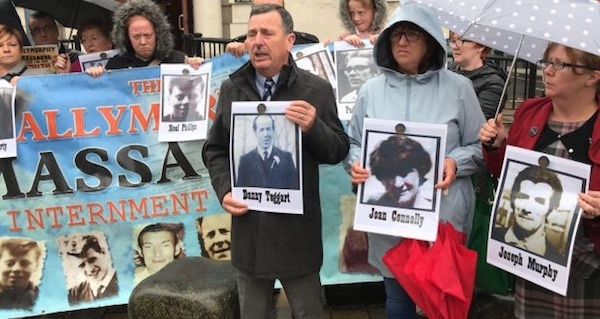 Those who died in the shooting outside the Henry Taggart Memorial Hall, on the Springfield Road, were Joan Connolly, Joseph Murphy, Daniel Teggart and Noel Phillips. The inquest has been listening to statements about the incident from those who are now deceased, cannot be traced or are too ill to attend and give evidence in person. The hall was being used as a base by soldiers from the Parachute Regiment. The victims had been standing opposite, across the road in a grassy area. Several witnesses had given statements saying that around half a dozen paratroopers emerged from the base in the evening and “just opened up” on them with machine guns. The statements explained how some parents were out looking for missing children amid the arrests by the Army and general turmoil of the first day of internment. Joanie Crone’s statement described how her husband Dessie had hidden in the field opposite the barracks as others were around him were shot and later managed to crawl to safety, despite continuing gunfire from the army base. Two men described hearing a child crying in the darkness and how they managed to persuade him to crawl through a fence to safety. The boy, Edward Butler, had been shot in the leg but survived, and is expected to give evidence in person in March. Joseph Murphy’s widow, May, described talking to him in hospital after the shooting, before his condition worsened, and he later died. He described being taken into the base, and being beaten and kicked, with rubber bullets being fired into his body at point blank range. Mr Murphy told his wife that his wounds, and those of others, were only dressed after the intervention of a younger soldier and an Army padre also in the base. Willie Ward’s statement described how he ran to safety with others, only noticing later that he had been shot in the shoulder. He sought treatment from his doctor, his statement said, but had not gone to hospital, because he had heard that anyone with a gunshot wound was being interned as a matter of course. Paul Connolly’s statement, given in recent weeks, told how his mother went to look for his sister and never returned.